As we are all aware, good eyesight is important to a driver. Countless articles have been written on this subject already. But readers have again and again written in to this blog to ask about it. Today, this article will therefore emphasize on it, in the hope that it will end the queries so frequently asked. Firstly, J.P.J. does not require you to undergo a medical examination. Nonetheless, it does however expect a potential driving student to possess good eyesight. To drive, a person has to be able to see clearly. To see traffic lights, car approaching, people crossing the road, car whizzing by, signboards and road directions. Not forgetting also the traffic policeman directing traffic. J.P.J. conducts a simple colour blind test during the Highway Code computer test which comprises of 50 questions. The 8 question colour blind test will be faced by all candidates before they are allowed to sit for the 50 question section of the objective test. It is necessary for a candidate to pass the colour blind test. What happens if you are unable to pass this test? Before I proceed to provide you with the answer to this question, allow me to tell you a little bit more about the colour blind test itself. The test comprises of 8 simple questions actually. A round circle or myriad colours with a number or diagram in the centre. You have to identify correctly what the number or diagram. This section requires one to read or identify normal car registration number which are usually black and white. This section goes on to test a candidate his capacity to identify major colours such as green, red and yellow. To pass the colour blind test, all one candidate has to do is get 8/8 correct. It’s as simple as that! But then, the problem with candidates is, some Fail. iv)	There are even some candidates who panicked and press the wrong key or answers on the computer itself, which eventually cause them to fail. What if a candidate should fail this part of the colour blind test? The candidate cannot then move on to the 50 questions Highway Code section. The clerk in charge will then instruct the candidate to go to the nearest J.P.J. office to be interviewed by officials there. You will first of all be provided a letter by the clerk itself. Obviously, a candidate who fails will face a whole lot of problems! A candidate failing will incur much expenses and time in this process. Normally, the driving school operator will be the one to take you to the J.P.J. office. And he will, I assume, be charging you quite a sum for his services. What will J.P.J. official advice you to do next? You will be asked to go to the nearest government clinic to undergo an eye test. This test will be much simple then the computer test version. Armed with the results, which normally a candidate will pass, you will then present it to the J.P.J. or the computer test centre. Which authority, I am uncertain. It’s best you ask the clinic for further advice. There are some candidates who in spite of being given a much simpler version of the eye test still cannot see colours at all. This is serious. The results is such candidates in reality cannot see any colours. For this, the results of the eye test at the clinic will then have to be presented to the J.P.J. and it is they who will make the final decision as what to do next. This elaborate description of the colour blind issue has been dealt with rather thoroughly and it hoped, in future no further queries will have to be raised again with regards to the problem. 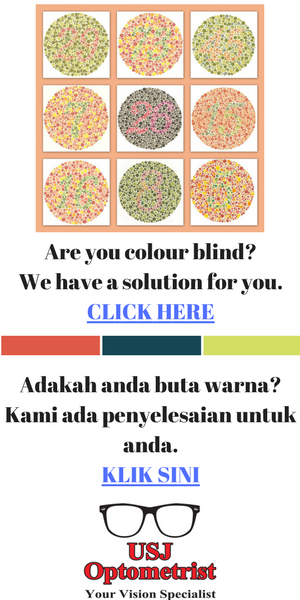 For Color Blind people who is in Malaysia can contact : Stanley Tien an optometrist. I been visit him regards my colorblind problems, he been helpful and explain well regards my problems. He’s been trained in UK and is the only one who had a New color blind system in Malaysia. I been searching this system for a years time. He changed my life to more colors after a treatment and assessment with him. I hope after you guys see him get a good treatment like me. I know how you feel, as my feeling is about the same to yours as a color blind people. Thank you for providing contact details of optometrist. Hope other readers will be able to make use of your suggestion. hi muhammad, i had just visited stanley , i am less red pigmentation according from stanley result. After of his assessment, i do know What is “purple”, “cokclat” ,real green”. He very nice and patience guy, i think his website is http://www.suntime.com.my . Muhammad i am staying in KL wat bout you? As stanley suggest we might can hanging out go for some gallery enjoy our color perception. Seriously, the place is far for me at the first place, after visited him i feel it is worth on my journey with my wife. Now i know why my wife been complaining on my car color is ” Gold Green” lolx. Glad you and Muhammad are benefiting from Stanley’s assistance. Its good to know that drivers are checked for couloublindness, but the students will know already whether or not they are colour blind and afterall its for their own safety as well as others on raod that they are properly equipped with all driving issues. I met my optometrist in Subang Jaya, Taipan after my optician referred me to see him for colour vision lens. You will see many ministry certificates in his shop, he is the trainer for government hospital optometrist for colourblind problem. You can call his shop number 03-80119038 to make appointment. Price is reasonable too. I’m quiet nervous! i planning to take my driving license next month. It’s my first time. Normal to be nervous. Prepare well for your test. I am not colour blind, am able to differentiate colours accordingly. But I have trouble identifying the numbers in the colour blind test. People say to go to an eye-doctor to have my eye checked up, and If its not serious, he will give me a letter to pass to JPJ so that i can be exempted from the colour blind test. Is this true? If you can’t pass the colour blind test conducted via computer, then you’re colour blind. No exemption is allowed by JPJ.